Demonstration sites, known as EverGraze Supporting Sites, have played an integral role in the EverGraze capability and adoption strategy, supporting groups of producers to try new grazing practices and perennial systems to increase profitability and improve environmental outcomes. Established in 2007, the Supporting Site network was funded as part of EverGraze for three years by Australian Wool Innovation (AWI), Catchment Management Authorities and other natural resource management boards. In this phase, over 50 sites were established across Victoria, South Australia, Western Australia, New South Wales and Tasmania. A second phase (2009-2012) was funded by Caring for Our Country and administered by Central Highlands Agribusiness Forum. Leadership and linkages to EverGraze were provided by the Agriculture Victoria. In this phase, a selection of the strongest eight existing Victorian sites and two sites in South Australia were continued, and sixteen new sites were also established, 13 in Victoria and three in NSW. In addition to the EverGraze Supporting Sites, a number of collaborating demonstration site projects including the Meat and Livestock Australia Producer Demonstration Sites and Yarram Yarram Landcare Group Healthy Soils project also joined the network. See the EverGraze Partners page for the contributors to the EverGraze Supporting Sites. Supporting Sites were managed by a host farm and at least one coordinator. Activities were held both at a group level and with the wider community. The range of group activities included paddock walks, formal and informal training, discussion sessions with research or other professionals and bus trips to see research and on-farm implementation in other regions across the project. Case studies were also developed highlighting the learning’s from each Supporting Site. Further information on activities can be found in the Supporting Site Impact Report. Key innovations implemented included sub-divisional fencing; implementation of grazing strategies on native and improved pastures; use and management of summer active perennials; use and management of temperate perennial grasses; and use of perennials for providing shelter for lamb survival. A number of sites also made significant changes to soil and livestock management. The EverGraze Quickchecks Guide was used for collecting basic data on the condition of pastures including ground cover, feed quality (percentage green versus dead), clover percentage, feed on offer (FOO) and perennial grass persistence (quadrant frequency counts). Sites monitored the DSE grazing days per hectare as the key measurement of productivity. Several sites also measured pasture growth and quality using a PROGRAZE stick, feed quality using feed tests, livestock weight gains and plant counts in newly established pastures. Wind speed and lamb survival rate was monitored at two sites which focussed on hedge-rows for lamb survival, based on methods used in the Hamilton and Wagga Wagga EverGraze Proof Site experiments. Details on some of the learnings on monitoring can be found under Reflections from the EverGraze team. Case studies compiled from most Supporting Sites provided strong evidence of the environmental and productivity impact of recommended practice changes. Environmental benefits included increases in ground cover, reduced weeds, increased perenniality of native pastures, persistence of sown perennials and reduced soil loss. Productivity benefits included reduced input costs, increased pasture growth, increased stocking rates and improved soil fertility. Further information, including financial impact analysis, can be found in the Supporting Site Impact Report. As a result of Phase II of the Supporting Sites project (2009-2012), it is estimated that over 1000 livestock producers made changes to their on-farm practices over 124,352 hectares. Practices implemented included changes to livestock systems and management (lambing and calving times, rotational grazing, and enterprise mix), changes to grazing management and farm layout (subdivisions, shelter, native pasture management, weed control and cover on hill country) and changes in the use and establishment of perennials. Further information on practice change can be found in the Supporting Site Impact Report. A significant amount of learning has taken place by project leaders, coordinators and administrators. The opportunity is to capitalise on what has been developed to implement very strong demonstration site projects for the future. Note some of the detailed lessons, particularly on funding, governance and personnel have not been presented here and can be found in the Supporting Site Impact Report. Larger scale demonstrations with combinations of practices (eg. pasture species combined with grazing management) across the whole farm are effective in building skills, knowledge and confidence of producers involved in groups. Collection of production data and demonstration of day-to-day management in the whole-of-farm context allows effective evaluation of the pros, cons and economic impact of practices on real farms. Larger scale demonstrations allow the group to explore a range of questions, stay engaged over several years and apply skills and knowledge developed through training. Smaller (or single paddock) demonstrations are useful for creating awareness and adapting new technologies (eg. new species or specific livestock management practices) for local environments (providing confidence to adopt) and collecting data for validation of models. Smaller scale demonstrations are not as effective for engaging groups for long periods of time or demonstrating application of skills and knowledge developed through training. Although it is not usually the intended purpose of a demonstration site to provide valid research data, use of a control, and where possible replicated treatments, makes a very big difference to the interest and credibility of the site for farmers. These elements are essential if the intention is to provide local validation of research, and are very useful for measuring economic impact. Local benchmark data can also be used to evaluate economic and production impact. While it’s important that groups are provided with the opportunity to come up with what they want to test themselves, input from scientists and advisors with good technical expertise is critical to set up a well designed and successful site. The most successful EverGraze sites were those that had close linkages with the research elements of the project and which the team had confidence in the practices being implemented (eg. pasture varieties chosen). Adequate time (at least six months lead time) needs to be provided to engage the group and relevant scientists in development of appropriate research questions and site design to ensure meaningful measurement and activities can take place on the site. For pasture-focussed demonstrations, peak productivity will be reached in the second or third year. To develop learnings about production and persistence of perennials, the demonstrations need to go for at least five years. EverGraze sites that ran for this longer period were most successful where there was more than one innovation tested on the property to help to keep the group interested. was able to present well in public. Within the Supporting Site project, several different monitoring techniques were used to collect information on soils, pastures and livestock production. Reflections and recommendations on which were most and least useful are provided below. measurements of feed on offer and ground cover. Photos of the group and host farmers (with their permission) are also useful for writing up case studies. At the Supporting Sites, perennial species persistence was measured at the autumn break as basal tiller density on fixed a point grid on nine sites across each paddock (see the Quickchecks guide for details). Both basal intersects and presence/absence of the species in the squares were measured. For the EverGraze sites, either method worked fine and only one was required rather than both. A photo of the grid was equally important. Pasture condition was measured on smaller squares at each of the nine fixed points (as for persistence) at the autumn break and at the end of winter. The measurements included feed on offer, clover percentage, ground cover percentage and green versus dead percentage. When the results were compiled, the clover and ground cover measurements were useful to show trends over time. However, where full composition (weeds, clover, annual grasses, perennial grasses) was recorded, this was more useful than clover alone. Green versus dead was useful to show differences in seasonal conditions over the years. The feed on offer measurements were only useful at the extremes – to determine if a paddock was over or under grazed and whether this had an impact on carrying capacity indicated by the grazing days. Soil tests were completed annually at each site. These were important for monitoring change through time and helping the group to learn how to calculate fertiliser requirements. The following pasture measurements were taken on some sites but were not part of the EverGraze protocol. 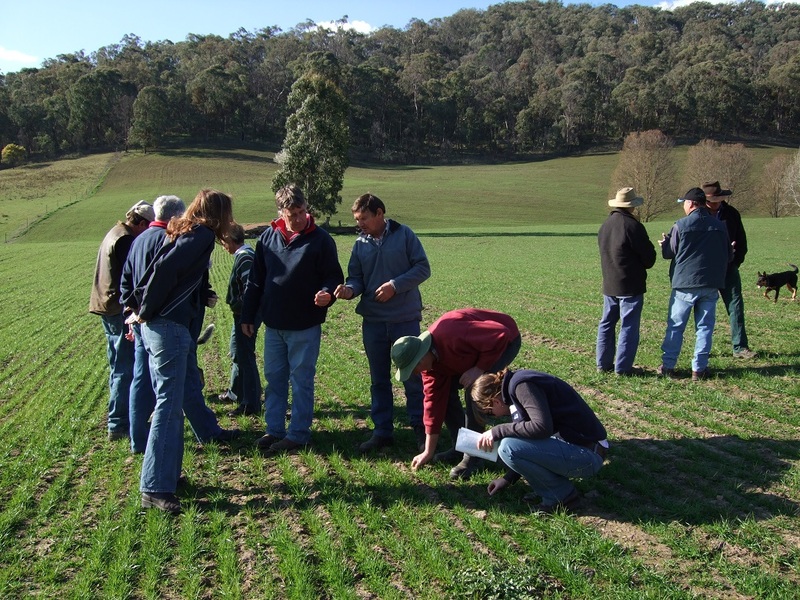 The Euroa Producer Demonstration Site is one example where all of these measurements were taken. Plant counts at establishment were useful where establishment success was a question. See the Euroa Producer Demonstration Site for details on how this was done. Pasture growth was monitored using a pasture stick with monthly availability measurements and factoring in consumption. The growth was not accurate enough to provide comparisons of different treatments, but was useful for the group to learn how to conduct feed budgets and ensure that pastures were being grazed to the right benchmarks. Feed tests helped to answer questions around feed quality between treatments at the Euroa Producer Demonstration Site. They are a very valuable learning tool for groups. Examples of production data which contributed to economic analysis on sites included DSE grazing days, input costs (eg. fertiliser), and in some cases, liveweight gains. Where this data was available, it was possible to use the EverGraze Pasture Improvement Calculator with groups to assess the costs and benefits of changes, and to conduct more detailed case studies for wider impact. Grazing days were the most useful measure of production. At the best sites, the paddock was run as part of a system where all paddocks (especially a control) were grazed to the same feed on offer, and followed EverGraze benchmarks of not grazing below 800 kg DM/ha and 70% ground cover. Grazing days were most useful for comparing to control or a second treatment rather than across sites. Grazing days were the simplest way of collecting production data and could be easily combined with benchmarks across sites to determine impact across a project. Regular liveweight measurements were only collected at one site (for growing cattle) – see Euroa Producer Demonstration Site. The producer group members found that when measured over the long term, the liveweight gains were the most interesting part of the project. Although it was difficult to see differences between treatments (due to issues such as gut-fill in short-term measurements), the pattern of gain and the practice of monitoring were some of the most significant learnings from the site. They also enabled accurate measurement of DSE grazing days and kg beef produced/ha. The measurement of weights would be less useful for a reproductive enterprise. It was critical to collect cost data for the establishment of pastures and any significant costs of management. This allowed financial analysis to be conducted for several sites and across the project, as well as running group activities using the Pasture Improvement Calculator. It was also important for site coordinators and hosts to record what they do to manage the pastures and livestock. Sometimes they forget significant parts to the story! Groups which met regularly as part of a producer group (usually part of another program where they were paying to be part of the group) stayed more engaged and interested than groups more ‘loosely’ formed which relied on ad-hoc field days and activities. There were a number of groups that engaged in structured training before setting up their sites and then continued to engage through the producer group throughout the program. These were the most successful groups in terms of engagement and achievement of practice change. Training “products” provide structure and focus to delivery and often achieve higher change outcomes than ad-hoc activities. EverGraze offered a number of short modules suited to producer groups towards the end of the project. These types of products would be useful to have on offer at the start of future demonstration site projects. Goal-setting, researchable questions and issues which are relevant to the site need to be identified by the group. Groups were asked to set a focus for the year both for their learning and the questions they were asking from their demonstrations (the two should be related). Where this occurred, the site was valuable and the group stayed engaged. Where it didn’t occur, activities tended to be less connected to the site itself. Facilitated goal-setting sessions (ideally associated with training) should be conducted well in advance of setting up sites. To avoid over-saturation of activities, it is best to utilise opportunities to collaborate for coordination of activities if multiple demonstrations are run in the one region. Combining component research, farming systems research, demonstration and extension in a single project allows for effective measurement of impact. There is significant scope to measure impact and potential impact of projects with a high level of data from research and demonstration. See the Final Impact Report for further details. There are obvious limitations to using Supporting Sites for demonstrating impact – they are often not replicated and/or with no control and are usually run over a short period so the impact of the season variability can’t be taken in to account. However, when placed in the context of local farms and supported by research, the sites often have a lot to offer both at a local group level as well as to the wider audience, which is why they lend themselves well to case studies. At the local level, there is all the associated knowledge and information sharing that comes with having a local site. Paddock walks with experts and sharing of similar (or dissimilar) experiences with others in the local area. At a wider level, there can be some great knowledge or ‘gems’ learnt from looking at what others have done, what worked and what didn’t. We can also use the information that was collected from some of the sites to demonstrate costs and sums on making improvements and those impacts on cash flow. Even if the results aren’t perfect for the above reasons or even relevant to other producers, the ‘how to’ and ‘why’ can be. Economic case studies developed for EverGraze look at full contract costs and impact on cash flow, what affects this and the payback period. Often producers are critical that payback periods estimated are too conservative so some of the economic studies investigate the impact of enterprise profitability, good or bad seasons, potential cost of failed establishment and back of the envelope versus the economists’ view! A science behind the story is included to align the practices implemented to the impact achieved through research sites and to explain the how and why the practices implemented can achieve the stated objectives. Supporting Sites have provided an effective two-way channel of information between researchers, public and private service providers and farmers. The direct interaction between EverGraze scientists, extension staff, Supporting Site groups and their coordinators played an important role in validating research outcomes, information and tools. The case studies (from site hosts and other group members) have been particularly useful to provide examples of how practices developed and/or promoted by EverGraze can be implemented on real farms. The direct participation of scientists, service providers and producer groups in making on-farm decisions for Proof and Supporting Sites has improved understanding about on-farm issues and practicalities of adopting new practices.